As stories of xenophobia lead the news yet again in South Africa, two of the country’s photojournalists are showing some of their work on the topic at the Johannesburg Holocaust and Genocide Centre in Forest Town. Killing the Other, an exhibition by Alon Skuy and James Oatway opened to a packed auditorium on Thursday, May 17. The photographs were taken by Skuy and Oatway throughout the country over a decade. Many were taken in informal settlements such as Diepsloot, Alexandra, Ramaphosa, Primrose, Kagiso and Soweto. According to Skuy, the exhibition should “communicate and to try to create awareness around what dangerous effects discrimination can have in society”. To Skuy, the photos are “a voice for the victims”. 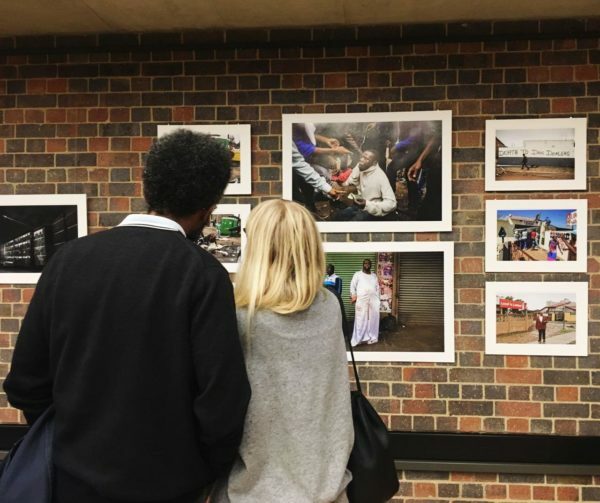 Oatway, who shot the harrowing images of the murder of Mozambican national Emmanuel Sithole in 2015, said that the purpose of the exhibition is “to encourage debate, remind people that this is an ongoing crisis and remember those who have lost their lives”. Oatway said he decided to collaborate on the exhibition with Skuy because he’s known him for a long time and respects his photography and work ethic. Admission to the exhibition is free and will be open to the public until July 1. FEATURED IMAGE: Killing the Other, an exhibition of photographs taken during the height of South Africa’s xenophobic attacks. Photo: Sanet Oberholzer.